The Homestead Act of 1862 brought about many changes in the young American Republic. Changes that today, over 150 years later, still effect the American Mid-West and the West. What was the Homestead Act of 1862? It was an Act passed by Congress to settle newly acquired territories by giving 160 acres of free land to Settlers if they lived on the land 5 years and made certain improvements to the land or lived on the land 6 months and paid $1.25 per acre. The Homestead Act of 1862 was officially terminated in 1976 for the 48 States and in 1986 for Alaska. To completely understand the Homestead Act it is necessary to understand the events leading up to it's passage, how successful it was and its aftermath today. In the mid-1800s America was a nation experiencing the Industrial Revolution in the north, a basic one crop economy growing cotton in the south and large western expansion. The western expansion began in 1803 with the Louisiana Purchase from France of 828,000 square miles of land. This land stretched from the Mississippi River to the Rocky Mountains and from the Gulf of Mexico to Canada. For a price of less than three cents per acre the size of the United States of America was doubled. In 1845 the Independent Republic of Texas was annexed by the United States of America. This annexation included portions of the modern States of New Mexico, Colorado and Wyoming. In 1846 the United States of America and Britain settled a boundary dispute. It was agreed that Britain would gain the land north of the 49th Parallel plus all of Vancouver Island. America would gain the Oregon Territory which today includes the entire States of Oregon, Washington, Idaho and portions of Western Montana and Western Wyoming. After the Mexican-American War of 1846-1848 and the Treaty of Guadalupe Hidalgo, Mexico ceeded to the United States of America what is now the States of California, Nevada, Utah, most of Arizona and portions of New Mexico, Colorado and Wyoming. The Gadsen Purchase from Mexico in 1853 completed the southern portions of Arizona and New Mexico. The Louisiana Purchase in 1803 had the effect of doubling the size of the Unites States of America. From 1803 through 1853, a period of 50 years, the size of America again increased to what we know as the lower 48 United States today. So in a 50 year period of time the new nation of America's size nearly tripled from what it had been at the turn of the 19th Century. The westward movement of settlers had begun after the American Revolutionary War with settling of the Ohio River Valley and the Tennessee River Valley. But with vast new areas to explore and settle it was just a matter of time before settlers pushed far beyond the Mississippi River areas looking for a place to call their own. Between May 1804 and September 1806 the Corps of Discovery Expedition led by Meriwether Lewis and William Clark explored the upper American Mid-west and the Northwest all the way to the Pacific Coast of modern day Oregon. In 1835 Dr. Marcus Whitman traveled to what is now the Western Montana and Northern Idaho area. He returned to the East and in 1836 married Narcissa Prentis. The newlyweds moved to the West and set up a Mission near modern day Walla Walla, Washington. They had a daughter, Alice Clarissa, who was the first white child born in the Oregon Territory. In 1843 Dr. Whitman again traveled East and on his return trip led a wagon train from Ft. Hall in what is now Southeastern Idaho across the mountains to the land beyond the Rockies. This established the Oregon Trail and was the beginning of the "Great Emigration" west to the Oregon Territory. In May of 1846 a group of 87 people set out from Independence, Missouri to go to California. This was a trip that was usually accomplished in 6 months. Along the way they decided to take a new route called Hastings Cutoff which crossed the Wasatch Mountains and the Great Salt Lake Desert of what is now Utah. This route was extremely difficult and ran along the Humbolt River in what is now Nevada where many wagons and cattle were lost. It was early November when the Donner Party reached the Sierra Nevada Mountains. While crossing them they were caught in an early snow storm high in the mountains near what is today called Donner Lake. With rapidly decreasing food supplies, some of the party set out on foot to go for help and after a hard struggle reached California in December 1846. Rescue attempts to reach those stranded high in the mountains were thwarted by bad weather and heavy snow. Finally, in the middle of February 1847 a rescue party made it to what was left of the original 87 members of the Donner Party. Only 48 of them lived to reach California, some surviving by eating those who died in the mountains. The years of 1846 and 1847 saw the beginning of the Mormon Migration to the Salt Lake Valley in modern day Utah. The discovery of gold at Sutter's Mill in California Territory in 1848 led to the California Gold Rush of 1849. Meanwhile back in the land along side of and east of the Mississippi River other problems were coming to a head. I have always been a United States History Buff. One of my favorite eras in the United States History is the period from about 1760 to 1900. In the mid 1990's I was privileged to spend a day browsing through the "stacks" of a small College Library in a quaint Eastern United States town. In that library I discovered several very old United States History books with printing dates in the late 19th century. A portion of the events in this section came from reading in those old United States History books. I was very aware of the role slavery played in the American Civil War. But these old history books opened up another aspect to what lead up to the Civil War that I had not known before that day. In the mid-1800s American northern States were experiencing the Industrial Revolution. A large part of this revolution was the building of Textile Mills which needed cotton to make the textiles. The American southern States were the world's leading producer of cotton. At first blush this would appear to have all the makings of a great partnership between the industrialists in the north and the cotton growers in the south. But these old history books told quite a different story. As concern over the plight of the black slaves in the South was mounting in the North, another question of Constitutional magnitude was brewing. Some Northern Industrialists wanted to purchase cotton from the Southern Growers at a reduced price. The Southern Growers were not interested in this deal because they could ship their cotton to England and Germany, pay for the shipping and when the cotton was sold, make more money than they could by selling the cotton to the Northern Industrialists at the reduced price they wanted. This developing problem caused quite a bit of hard feelings between the Industrialists and the Cotton Growers. The Industrialists lobbied for Congress to pass a law requiring the Cotton Growers to sell them the cotton at the price they wanted to pay. The South raised the question of State's Rights. Under the Constitution there was no provision allowing Congress to require a State or a group of States to be subject to a law such as the Industrialists wanted. In fact, under the 10th Amendment, the last of The Bill of Rights, it says, "The powers not delegated to the United States by the Constitution, nor prohibited by it to the States, are reserved to the States respectively, or to the people." The question in many minds in the South was whether Congress in Washington D.C. had the Constitutional authority to over ride the wishes of a State? This issue of State's Rights was fanned by a desire for Congress to pass a law allowing American's to settle land west of the Mississippi River for the purpose of not just settling the newly acquired territory but specifically to farm it and grow crops to sell. Rightly or wrongly, many Congressmen from Southern States felt this purposed Homestead legislation was a threat to the economic viability of the American South. So whenever this Homestead Bill would come up for a vote, the southern Congressmen were able to defeat it. One slogan some Republican's running for national office in the 1860 Election used was, "Vote Republican and vote yourself a farm." This slogan did not help heal feelings in the American South. After the Republicans won the Presidency in the 1860 Election, several Southern Politicians felt their only safe course was to secede from the Union and form a country of their own. With the start of the Civil War in 1861 and no Southern Congressmen present to vote down a Homestead Act, on May 20, 1862 Congress in Washington D.C. passed the Homestead Act of 1862. In 1862 the Civil War was not going in the North's favor. Perhaps this fact played a role in the provisions of the Act? This Act provided that any American or person who intended to become an American including freed slaves who had never borne arms against the U.S. Government could file an application and lay claim to 160 acres of Government Surveyed Land in the Western United States Territories. Live on the land for 5 years, build a 12 by 14 dwelling with one window, dig a well, make a road and raise crops. After 5 years the homesteader could pay a small registration fee and file for a Land Patent (like a deed) at a local land office by showing proof of residency with no absences longer than 6 months and proving he had made the required improvements. If the settler was willing and able he could pay a fee of $1.25/acre ($200 total) after living on the land for only 6 months. Once the Local Land Office had received proof of residency and of the Homesteader making the required improvements to the land, the paperwork was forwarded to the General Land Office in Washington D.C. Here the claim was investigated and valid claims were granted a Land Patent giving the land to the Homesteader free and clear. The provisions of this Homestead Act were to go into effect on January 1, 1863. Daniel Freeman was a Union Army Scout who was to leave Gage County, Nebraska Territory on January 1, 1863 for duty in St. Louis. While attending a New Years Eve Party, Freeman met a local Land Office Official and convinced him to open the office shortly after midnight so Freeman could file a land claim. Freeman filed a claim for 160 acres of land near Beatrice, Nebraska. In 1936 the U.S. Department of the Interior recognized Freeman as the first person to file a claim under the Homestead Act of 1862. A national Homestead Monument was erected on his homestead near where a school was built in 1872. The National Park Service operates this monument which commemorates the changes to the land and nation brought about by the Homestead Act of 1862. The Freeman School, pictured here, was restored by the National Park Service to appear as it did during the 1870's. The school was built of one foot thick red brick and was a one room school house from 1872 until 1967. 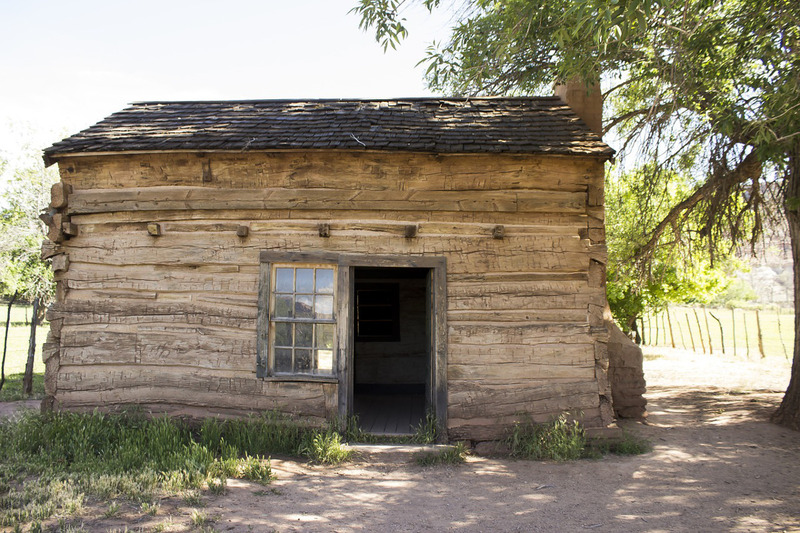 Most Homesteaders on the Mid-Western Plains were people with few and very limited resources. The most common type of shelter built was a Sod House made out of the dense roots and dirt of the prairie grass. These homes were typically only one to three rooms in size and were dark, damp and typically insect infested and could easily flood in rainy season. Those who could afford to do so upgraded to wooden homes or built wooden homes initially. Many times when the settlers dug a well the water obtained was not suitable for usage by humans. Those whose well was not usable often traveled miles to haul water back home or learned to collect rainwater for usage. They used and reused their water by sharing bath water and in some cases, literally licking plates clean. Prairie Outhouses were often unsanitary, had an unbearable stench to them and were infested with insects. Homestead families were often separated by several miles which led to loneliness and boredom making the homesteading chores much more tiresome. Once chores were done homesteaders depended upon reading books, the occasional newspaper or mail which was delivered irregularly. Those blessed enough to live in an area with several homesteading families would gather for barn-raisings, quilting bees, corn husking or anything that would allow socialization. When an area had enough homesteaders there would be schools, churches and libraries built in the community. With summer droughts and insect infestations it was hard for a Mid-Western Homesteading Family to earn a living by farming. Then there were the winters. Blizzards that killed livestock. Blizzards that isolated families. The ingenious, resourceful and determined managed to get title to their homestead land. The rest gave up and left. Depending upon the source you read, anywhere from 33% to 52% of those who attempted to Homestead on the American Plains never acquired title to their claim. Those who stuck it out burned buffalo chips and dried cow manure for warmth and fuel to cook. When these were not available they twisted grass together and burned it along with dried corn husks and buffalo fur. They made rocking chairs out of empty barrels. They turned trunks on end and used them for closets. They made beds or sleeping shelves out of scrap wood and made mattresses out of prairie grass. They grew, hunted and fished for what they ate. Sometimes they could supplement their food with items from the nearest General Store which could be a day's journey away. Any extra food they had was preserved to get them through the lean times when crops failed or for eating during the winter months. Meat was smoked or cured, vegetables and fruits were canned or pickled . Homesteading the American Mid-West has been romanticized. In reality it was hard and at times back-breaking work. It was especially hard on the women. In addition to helping their husbands farm, they had to care for children, maintain the home, cook and preserve food. Yet single or widowed women were able to Homestead themselves. Some sources claim that up to 12% of homesteaders in the Rocky Mountains were women. The Pacific Railroad Act was signed by President Abraham Lincoln on July 1, 1862. It gave extensive land grants in the Western United States to the Union Pacific Railroad Company and the Central Pacific Railroad Company. The Central Pacific Railroad later became the Southern Pacific Railroad Company. By 1871 the railroads had been given in excess of 175 million acres of public land by the government. This was a land area more than 10% of the nation and larger than the State of Texas! The railroads sold land to the arriving settlers for a handsome profit. The most expensive lands were those closest to the rail road tracks. Those who had the funds to purchase this land bought the prime locations near railway stations. After the Civil War, Union soldiers and sailors could deduct the time spent on active duty from the five years residency requirement to obtain a land patent for the land. Confederate Soldiers were prohibited from Homesteading under the 1862 Act. However, in the late 1860's Idaho Territory became a popular destination for displaced Confederate Soldiers whose homes had been destroyed in the war. These displaced Southerners made up a large portion of the territorial legislature in the second half of the 1860's. Their views often clashed with the appointed Republican governor's of the territory. But by the early 1870's the clashes ended and attention was turned to caring for the land and families who lived there. In 2003 my wife and I moved from Tennessee to Boundary County Idaho. Boundary County's northern border is Canada. The County Seat is Bonner's Ferry located on the Kootenai River, a major tributary of the Columbia River. At that time the local Safeway Grocery Store was located in the middle of the downtown area across from the Post Office. Above the front windows of the store were pictures of some of the founding citizens of the area. A large portion of those men were pictured in their Confederate Army uniforms. When the Act was passed, May 20, 1862, the Civil War was not trending in the Union's favor. Even though most of the battles were fought in southern territory, most of the battles at that time were being won by the South. Perhaps this gave increased impetus for the passage of a Homestead Act out of the desire or possibly a fear that the outcome would not favor the Union? In case that happened maybe the feeling was that a homesteaders in the west would be much more likely to become a part of the Union instead of the Confederacy? Early in 1862 the 37th Congress Committee on Public Lands Chairman John "Bowie Knife" Potter of Wisconsin submitted House Resolution 125, (HR 125), to the House of Representatives. While the bill was being debated, Congressman William S. Holman of Indiana decried, "the extraordinary facilities which our land policy has hitherto furnished for capitalists to almost monopolize the public lands. Instead of baronial possessions, let us facilitate the increase of independent homesteads. Let us keep the plow in the hands of the owner. Every new home that is established, the independent possessor of which cultivates his own freehold, is establishing a new republic within the old, and adding a new and a strong pillar to the edifice of the State." As the debate on this proposed legislation continued, it was apparent that a majority of the Congressmen believed that the nation would be made stronger by grateful homesteaders. These homesteaders would thank a benevolent and caring government for giving them the means to live as free people. When it was time for the Congressmen to vote, the Homestead Act passed 107 to 16. Unfortunately, history shows us that over the next 40 years the Federal Government gave less than 20% of the 500 million acres it dispersed to homesteaders. Over 400 million of those acres went to Land speculators, railroads and wealthy ranchers! In 1862 there were no politicians in Washington D.C. who were really familiar with the differences between the America East of a line running north and south along the Iowa and Missouri western borders and the Western American Territories. The American East the politicians were familiar with had ample rainfall, good soil, plenty of rivers, creeks, springs, abundant trees and forests. A landholder could thrive on a plot of ground as small as 40 acres. He could raise enough food for his family plus some to sell to be able to purchase other necessities. He had ample material available to build a dwelling and to supply fuel for cooking and winter's warmth. The Appalachian Mountains of Eastern America had lush coverings of forests with relatively few areas that were above the tree line. Even though there was snow and cold, the Appalachian's could be crossed fairly easy and safely during winter and this was done on a regular basis. By contrast the mid-western territories had large expanses of prairie covered with grass where one could travel for days without seeing trees except for those growing beside the occasional river or stream. The area had much less rainfall than what the American East had. It is a good probability that very few, if any, politicians who voted for the Homestead Act of 1862 had ever seen the deserts of the American Western Territories or realized that to be productive, large areas of these territories would need extensive irrigation. In many areas west of Iowa and Missouri 160 acres was not sufficient land to eke out a living much less have produce left over to sell to be able to purchase other necessities. The Kinkaid Act of 1904 attempted to remedy this problem in the mid-west by raising to 640 acres the size of homesteads on land that were only suitable for grazing. In 1909 the Enlarged Homestead Act raised the acreage from 160 to 320 acres in other parts of the west. The Appalachian Mountains are beautiful with their forests, and Rhododendrons. The Rocky Mountains are magnificent in their grandeur being easily twice the height of the Appalachian Mountains along much of their mountain chain. In many places the Rockies have snow covered peaks well above the tree line all year round. As many settlers learned, some losing their life in the experience, the Rockies were not easy to cross in the wintertime. In many areas of the American Territories there were not sufficient local Land Offices and personnel. This led to problems verifying a settler's length of residency and having made the required improvements to the land. The distances between the Local Land Offices and the General Land Office in Washington D.C. led to problems. One problem was the difficulty investigating the claims resulting in much bribery of the overworked Investigators who did not have the time to adequately investigate all claims. This survey system was much easier to use when surveying the land than the system used in the American East. The Rectangular Survey system was based upon a series of large rectangles being surveyed into smaller rectangles. For example, a square mile contains 640 acres and is one mile long on each of it's four sides. If that square mile is divided in half, either by a line running north and south or by a line running east and west, it now contains 2 rectangles of 320 acres each. This 320 acres is a 1/2 mile long on it's 2 shorter sides and 1 mile long on it's 2 longer sides. To get a parcel of land that is 160 acres in size a line is made that runs either north and south or east and west dividing the 320 acre rectangle in half. All 4 sides of this rectangle are a 1/2 mile long. This results in Homesteads where the nearest neighbor could be a 1/2 mile away. This led to the deaths of many Homesteaders when there were Indian uprisings because it was difficult to get together to help defend each other. The last claim under this Act was made by a Vietnam Veteran named Ken Deardorff. He successfully homesteaded 80 aces of land on the Stony River in southwestern Alaska in 1979. But it was 1988 before he received the Land Patent Title to his land. From the viewpoint of government the Homestead Act of 1862 was a success. Settlers with American citizenship moved to thinly-populated areas in the American Territories. Between 1862 and 1934 some 270 million acres had been successfully homesteaded. The reality is that this Act and its modifications also set the stage for several land booms and busts and instances of corporate fraud. It also set up the Federal takeover of land in excess of 600 million acres, land Congress originally intended for homesteading by private citizens. What Was The Purpose of The Homestead Act of 1862? The purpose of the Homestead Act of 1862 was to settle the newly acquired lands in the western united States by Citizens who would be farmers and populate the region. Depending upon which history book you read, it was successful or it was not very successful. The Homestead Act Impact America? It helped open up the American Mid-West and West to settlement by homesteaders. It could have been more successful if there has been more Land Agents and Investigators. No, the Homestead Act has nothing to do with creditors. Some States have passed Homestead Laws that exempt a portion of the value of your land and house from Property Taxes and Court Judgements. The Homestead Act and Homestead laws are not the same thing.